Manly Spirits Co. has just launched its debut range of premium spirits after celebrating a clean-sweep of recent medal wins at the 17th San Francisco World Spirits Competition (SFWSC) and 2017 Australian Distilled Spirits Awards (ADSA). The first distillery to open in Sydney’s Northern Beaches, Manly Spirits Co. does things “the Australian way”. Sustainably sourced native and foraged marine botanicals are used for a uniquely Aussie flavour experience, including wattle seed, sea parsley, anise myrtle, mountain pepper leaf and finger lime. Head Distiller Tim Stones, formally of Beefeater gin and Chivas Brothers Limited, said, “The Manly Spirits Co. team are continually exploring the Australian botanical pantry and are drawing inspiration from the natural surroundings of Manly’s famed marine sanctuary. “Our signature whiskies, gins and botanical vodkas, will be complimented by a rotating seasonal small-batch collection, The Distillery Expressions, that will be available exclusively at the Distillery Tasting Bar for industry and visitors to try”. The distillery’s newly launched range includes Manly Spirits Australian Dry Gin, Manly Spirits Marine Botanical Vodka, Manly Spirits Terra Firma Botanical Vodka and North Fort White Dog Malt Spirit. The bottles feature raised foil label features, celebrating the distillery’s recent medal wins. On the success, Manly Spirits Co. Founder and Director David Whittaker said, “We are thrilled to have received awards at two of the world’s prestigious spirits award competitions for our launch expressions. With a high proportion of spirits consumed in Australia imported from other countries, we believe there is a fantastic opportunity to showcase Australian craft spirits and are proud to be part of this movement”. 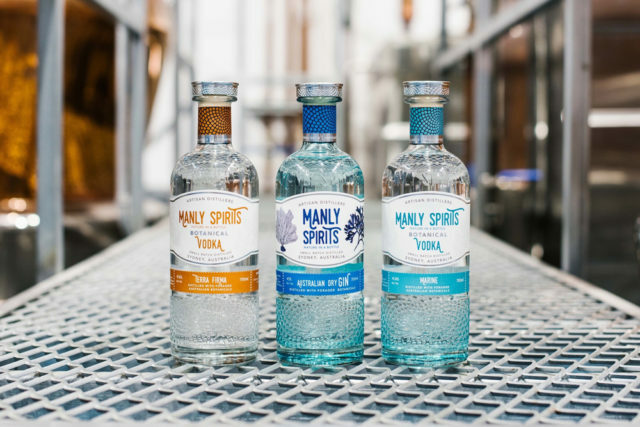 Manly Spirits Co.’s range of premium Australian craft spirits is now available nationwide. Further product details below, and for more information, check out manlyspirits.com.au. Tasting Note: Bright, fresh citrus nose with gentle peppery flavour and a rounded, lingering finish. Key Ingredients: Ten botanicals including traditional gin botanicals, orange peel, sea lettuce, finger lime, anise myrtle and mountain pepper leaf. Medals: 17th SFWSC Silver in Gin category; ADSA Silver in New World/Contemporary Gin category. Tasting Note: Sweet orange nose, with a rich roasted nutty finish. Medal: ADSA Bronze in Flavoured Distilled Vodka category. Tasting Note: Savoury, sea air notes on the nose, gentle umami flavours on the palate. Medal: ADSA Silver in Flavoured Distilled Vodka category. Tasting Note: Notes of grain and cereal Australian malted barley delivers an elegant rich character with a full-bodied and lingering finish. Key Ingredients: Australian malted barley spirit.